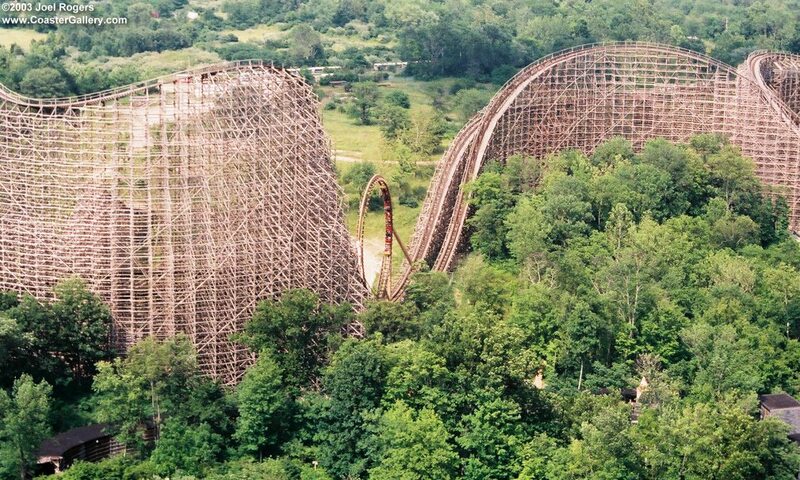 As we continue to advance through the history of roller coasters, this week we’ll explore a ride that sought after too many records without taking proper safeguards: Son of Beast at Kings Island. Without a doubt, the Coaster Wars following the debut of Magnum produced some of the best of the rides we have today. Steel coasters improved vastly with each new record broken, but the era seemed to have a dark side when it came to wooden coasters. Many “woodies,” like Mean Streak, were built for height alone and aged quickly, while others dove into advanced maneuvers without developing proper technology or thoroughly testing them. 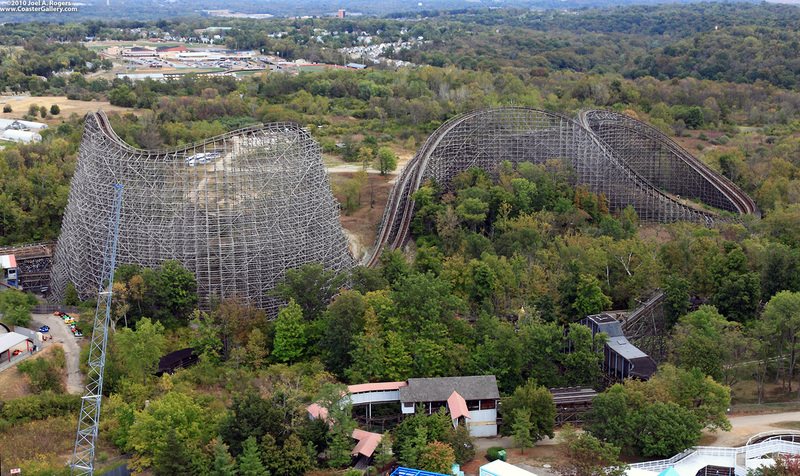 Perhaps the most famous coaster in this second category was Kings Island’s short-lived Son of Beast. In the year 1997, Kings Island was a flourishing amusement park. Famous for its stunning lineup of roller coasters, including The Racer, Vortex, and The Beast, the park was sought after by thrill seekers all over the country. With the new millennium rapidly approaching, Kings Island management began looking into their options for the park’s next big investment. A fairly new manufacturer known as the Roller Coaster Corporation of America (RCCA) approached the park with a concept that seemed too good to pass up – the world’s first wooden hypercoaster. Son of Beast, as they called it, would stand 218 feet tall, reach speeds of 78 miles per hour, and stretch over 7,000 feet long. Two 540-degree helices would elicit extreme G-forces as they spiraled inside the ride’s vast footprint. But the coaster’s signature element would be a towering 100-foot vertical loop, placed just after the first drop. The ride concept was simply stunning, and park fans caught their breath with astonishment as they took in Kings Island’s announcement in 1999. Son of Beast would break seven records when it opened the next year. Construction began that summer, but major design flaws came to light and Kings Island management was forced to fire RCCA before the ride was completed. 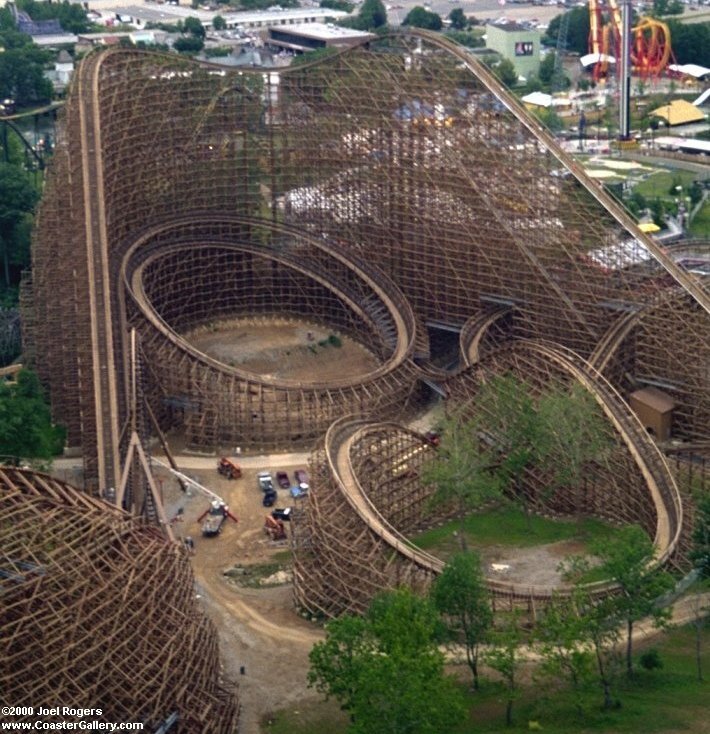 Though Son of Beast premiered within a month of its scheduled opening date, more problems were discovered and the coaster faced major downtime that summer as the park tried to fix them. Kings Island sued the ride’s manufacturer for poor design and insufficient supports, but RCCA blamed the problems on the park’s decision to let them go before the construction was complete. Kings Island knew that they had gotten themselves into a mess, but it was too late to do anything about it. It wasn’t until 2006 that the ride experienced its first major accident. As the train entered one of the large helixes, a main support beam cracked, creating a large bump in the ride’s track and causing the train to come to an abrupt stop. Though all of the riders survived the incident, twenty-seven injuries were reported. Son of Beast remained closed for the remainder of the season as the park completed an investigation and sought to return the ride to a safe condition. Kings Island replaced the original trains with lighter ones that put less stress on the track, but was forced to remove the ride’s record-breaking vertical loop to accommodate the new trains. Four more incidents were reported, including a death in 2007, but it was found that these injuries were due to pre-existing health conditions and not due to flaws of the ride itself. A final accident in 2009 caused the ride to shut down once more, when it was reported that a woman suffered from a burst blood vessel in her brain caused by the ride. Son of Beast remained standing but not operating for three years as Kings Island struggled to decide what to do with the coaster. Over the years, they had already spent $30 million trying to streamline the ride, so redesigning the coaster seemed out of the question. Finally, in 2012, the park announced their decision to remove Son of Beast to make way for future expansion. The world’s only wooden hypercoaster was torn down that November. What went wrong? A lack of thorough testing, as well as research and development, caused the ride to rapidly deteriorate. Perhaps Kings Island became a bit too caught up with the Roller Coaster Wars and grew lax when it came to ensuring that Son of Beast would be a reliable ride. Whatever the reason for its failure, Son of Beast put a damper on the successes of the era and brought wooden roller coaster development to a crawl. To this day, no woodie has broken the 200-foot barrier or passed 75 miles per hour. Years went by before any manufacturer was willing to design an inverting wooden coaster again, and it took Rocky Mountain Construction’s reliable Outlaw Run to advance wooden roller coaster design once more. Perhaps one day we will see a wooden hypercoaster again. What can be learned from Son of Beast’s mistake? Though innovation can be exciting, it is absolutely necessary to complete thorough testing on something before diving headlong into the production stages. This is something that I think roller coaster manufacturers have really caught onto in recent years. Share your thoughts on Son of Beast’s rough history – why do you think the ride failed? Check back next week, when we’ll be discussing our final roller coaster in this series. Replies on this system work about as well as the theming on a Cedar Fair ride! Inform your tech support that most time out and don’t work.